The Blackmagic Design ATEM Constellation 8K is a powerful switcher in a 2 RU chassis which can easily handle 4K video and supports 8K. It features a built-in control panel on the front and 40 12G-SDI inputs, with two main and 24 AUX 12G-SDI outputs. Each input has its own standards converter, which allows you to seamlessly switch between inputs no matter what format it is. 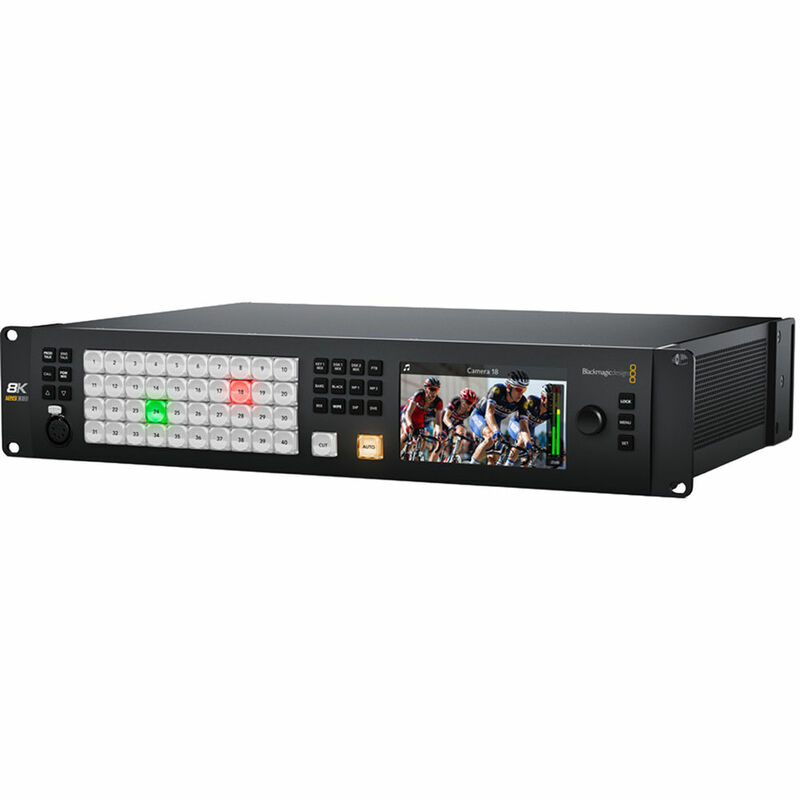 The Constellation 8K incorporates four DVE, 16 Keyers, and four media players, allowing for flexibility in creating your program. Four multiview outputs enable viewing 4, 7, 10, 13, or 16 simultaneous views. The relatively large LCD view screen on the front of the unit displays the input video with a label of the input number. You can control the Constellation 8K locally via the front panel buttons, or you can use the built-in Ethernet connector to control the system from a computer using the included control panel software. The built-in Fairlight audio mixer supports 80 channels of de-embedded audio from SDI, plus 64 channels via MADI in. Talkback functionality is available via the 5-pin XLR on the front of the unit, or the RJ12 connector on the back. 4 downstream keyers in Ultra HD, 2 in 8K. Control is via front push-button switching with illuminated buttons, software, or an optional hardware panel. The included ATEM Software Control Panel provides control over the switcher. Featuring a well-designed interface with a visual switcher and parameter palettes for making quick adjustments, the ATEM Software Control also lets you access camera control, audio mixing, media, macro programming, and even control of HyperDeck disk recorders. The ATEM Constellation features a built-in Fairlight audio mixer that makes it possible to do extremely complex live sound mixing. The internal mixer supports up to 156 channels. Eighty mixer channels are de-embedded from the SDI inputs, and each input channel features a high-quality 6-band parametric EQ and compressor, limiter, expander, and noise gate, as well as full panning. Extra channels for the analog input, talkback microphone, and media players are supported as well, and the audio mixing features can be controlled via the ATEM Software Control, a Mackie-compatible panel, or Fairlight Audio Console. The ATEM Constellation 8K features 16 ATEM Advanced Keyers for high-quality chroma or luminance keying. The chroma keyer features a color picker to sample background colors for automatic generation of the key parameters. Precise controls for edge and flare are supported, and there is even a foreground color corrector, so you can match the "look" of the foreground layer to the background layer for making seamless compositions. The keyer can also be used for pattern and DVE keying. Then when you switch to 8K, you still get four independent full-resolution 8K ATEM Advanced Keyers. Built into the ATEM Constellation 8K is a variety of broadcast-quality 8K native transitions such as mix, dip, wipe, and more. All transitions can be customized by adjusting parameters such as their duration, border color, border width, position, and direction. Transitions are in full 8K native. Also included are DVE transitions, suitable for graphic wipes and stingers when used with the internal media players. The built-in media pool stores broadcast-quality RGBA graphics and animations that can be played back instantly by the two media players. The media pool can hold up to 24 full-resolution 8K stills, or 64 Ultra HD or HD stills. Motion graphics clips for use in animations and stingers can be up to 100 8K RGBA frames, 400 frames in Ultra HD, or 1600 frames in 1080 HD. Color Space REC 601, REC 709, REC 2020. SDI Auto Switching Automatically Detects between Level A and Level B 3G/6G/12G-SDI. Requires 2SI in 8K Mode.